The Vacation Watch Program is designed to provide you with peace of mind that your house will be looked after while you are away. If you are planning a vacation, the San Luis Police Department can offer extra patrol to check on your property. The Vacation Watch Request Form can be obtained at the San Luis Police Department or you can download the form below. 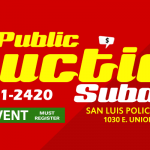 Please submit your request in person at the San Luis Police Department or call us at 928-341-2420 to have an officer assist you in completing your request. Your request must be made at least a week prior to your absence when possible. The Vacation Watch program must be for a minimum of 4 consecutive days with a maximum of 15 days. Officers will periodically check your home depending on the call loads.